In the darkness of the early morning hours of 26 February 1852, on an isolated stretch of the notoriously dangerous southern Cape coast, an epic maritime drama unfolded as Her Majesty’s Transport Birkenhead was wrecked on an uncharted rock. Although the wreck of the Birkenhead was one of the worst maritime disasters ever on the South African coast, the event has resonated down the years for other reasons, and in the annals of shipping disasters represents a profound moment of self-sacrifice and courage beyond imagining. The story of the wreck of the Birkenhead begins in Cork in Ireland in January 1852, with the embarking of 479 soldiers from a variety of regiments, who were bound for the Eastern Cape, where they were to reinforce the British troops involved in the Eight Frontier War. A number of military and naval officers, more than 50 women and children, and a crew of 125 rounded off the Birkenhead’s complement on her last, fateful voyage – 693 people crammed into an iron hull less than 64 metres long and a little more than 11 metres wide. Although rough, the voyage to the Cape was uneventful, and the Birkenhead arrived in Simons Bay on 23 February to take on provisions before the final two day push to Port Elizabeth. Fresh water, food, 350 tons of coal, and nine officers’ horses and their fodder were taken aboard over the next two days, and early in the evening of the 25th, the Birkenhead steamed out of False Bay, en route to her appointment with history. In considering the loss of the Birkenhead, it’s important to touch on the history of the ship, which is also the history of the Royal Navy’s first use of iron steamships, rather than wooden sailing vessels. During the late eighteenth and early nineteenth centuries the shipyards of Europe began experiencing shortages in the supply of the immense amounts of timber required for the construction of wooden ships, and were forced to consider other materials for the construction of these vessels. Iron began to replace wood for certain structural elements of ships, and it wasn’t long before the first iron-hulled commercial vessels were being built. Despite all evidence to the contrary, the British Admiralty believed that an iron-hulled warship would sink, would be too difficult to repair, would not last as well as a wooden vessel, and that the iron would play havoc with compass accuracy, and steadfastly refused to consider the new technology. However, a number of iron paddle steamers – particularly the frigate Nemesis built by John Laird of Birkenhead – were very successfully employed in naval conflicts in Mexico and the Far East, and finally persuaded the Admiralty to consider buying iron warships of their own. Amongst the shipbuilders whose plans were accepted by the Admiralty was Laird, and in December 1845 a vessel named Vulcan by Laird and designed as a frigate, but to be renamed Birkenhead by the Admiralty and modified to serve as a troopship, was launched. Displacing 1 918 tons, the Birkenhead was representative of early attempts to marry sail and steam. She was rigged as a brigantine, but carried a tall funnel between the fore- and main masts, while below decks two single-pistoned engines, with a collective 350 horse power, were coupled to a pair of paddlewheels set on the outside of her hull, each six metres in diameter. Her construction, too, reflected a stage in the transition from wood to iron shipbuilding, with her hull constructed of riveted iron plating, and her decks, paddle boxes and masts made of wood. Another important feature of her construction were a number of iron bulkheads which divided the vessel into several watertight compartments. However, the integrity of these bulkheads was compromised during her conversion to a troopship in 1850, when they were pierced by doorways to improve ease of access and movement for the troops she was to carry, and probably ultimately contributed to the speed of her loss in February 1852. In 1851 the Birkenhead, under the command of Captain Robert Salmond, began her career as a troopship, ferrying troops to the Channel Islands and Lisbon, and visited the Cape. Early 1852 she once again left for the Cape Colony. After her rough Atlantic passage, those aboard the Birkenhead could not have asked for better weather as she left Simon’s Town. The sky was clear and the sea flat and calm. A course was set which would give the dangerous Agulhas coast a wide berth, and soon all but those on watch were asleep in their quarters. At roughly 2 am, as the Birkenhead neared Danger Point, there was a grinding crash and the vessel lurched to a halt, impaled on an uncharted pinnacle of rock – today known as Birkenhead Rock. Her hull near the bows was ripped open and a wave of icy water rushed into the lower troopdeck, trapping and drowning many of the sleeping soldiers billeted in the bowels of the ship. A mad scramble ensued by those still able to reach the deck, and panic stricken soldiers in various states of undress streamed onto the upper decks. Meanwhile, up on deck, Captain Salmond, awakened by the impact, had quickly taken stock of the situation and immediately ordered the engines stopped and the boats launched, with instructions to get the women and children into the boats first. Lieutenant-Colonel Seton, the officer commanding the troops on board, now also on deck and noting the soldiers milling around, summoned his officers and instructed them to establish order among the men before things got out of hand. Ten minutes had passed since the Birkenhead struck and Captain Salmond was becoming increasingly concerned that grinding on the rock which still held her fast, the vessel would break up before the boats could be got away. He then made a fateful decision, ordering Mr Whyham, the engineer, to put the engines in reverse, and attempt to back the ship off the rock. Accompanied by the screeching of tearing metal the Birkenhead pulled free – and struck again. Those in the engine room could only stare in horror as the deck under their feet bulged upwards, the iron ribs twisted and a tear appeared in the hull. Water again poured into the ship, this time dousing the boiler fires, and stopping the Birkenhead’s engines for good, as the crew of the engine room were forced to scramble to safety. As the Birkenhead began to sink by the bows, the captain asked Seton to muster his men on the poop deck at the stern of the ship, so as to lighten the bows, and at the same time instructed Cornet Ralph Sheldon-Bond of the 12th Lancers, the officer in charge of the horses, to pitch them overboard. Alerted by the thrashing, Great White sharks from nearby Dyers Island arrived on the scene, and soon began attacking the horses struggling in the water. The seven women and thirteen children who remained aboard the Birkenhead after the stop in Simon’s Town and who had been huddled together under the poop, were now helped down into the second cutter lying alongside the ship. Some sailors were ordered to man the oars, and then, with thirty-five people in the boat, they pulled away, stopping some distance off to watch the dying ship. Below decks, soldiers frantically manned the chain pumps in a vain effort to hold out the sea, while up on the main deck, the crew struggled to launch the boats, succeeding only in getting three of the ship’s eight boats into the water. Meanwhile, hundreds of soldiers waited in their ranks on the poop deck. Barefoot and semi-dressed for the most part they kept their eyes on Seton and his officers, awaiting orders. Then, with a terrible groan the Birkenhead tore in half behind the foremast, and her entire bow section sank. The rest of the ship lurched forward and deeper into the water, sending the funnel crashing down on the men still trying to launch one of the boats, and hurling others into the water where they were sucked down after the sinking bow or assaulted by pieces of floating debris and wreckage. Again, there was the sound of ripping metal as the hull tore a second time just in front of the paddle boxes. As the Birkenhead broke in half her fore section plunged to the seabed, while her stern, although now on even keel, began sinking rapidly. The vessel was now clearly doomed. Captain Salmond climbed up into the rigging and shouted to those on the decks that whoever could swim should jump overboard and make for the boats. Realizing though that the already overfull boats would be swamped under a tide of desperate swimmers, Seton and his officers called out to the soldiers not to go overboard. Instead, the young troops stood still in their ranks on the deck as it gave one last convulsive lurch and slipped beneath the water, only twenty minutes after the Birkenhead struck the rock. In the water, hundreds of desperate men struggled to stay afloat, clinging to whatever debris they could find. Some tried to find a place in the boats which still stood by, but no more than a few could be accommodated. The cutter carrying the women and children was already full to capacity, while the second cutter had thirty-six soldiers and sailors crammed into it. The gig took nine men. Of the 638 people aboard the Birkenhead when she was wrecked, only eighty found places in the boats. Many men climbed the maintop mast which protruded from the water, as if to mark the grave of the Birkenhead, and soon more than forty-five survivors were clinging to the rigging. Still others struck out for the shore, nearly two kilometres away, some swimming, most clinging to bits of wreckage or makeshift rafts. Sixty eight men survived the ordeal of the long swim in icy water, the sharks, and the kelp, to haul themselves ashore: many others did not. Once full, the boats could do no more, and pulled away from the wreck to seek help, as the cries of the men in the water gradually diminished and finally stopped altogether. 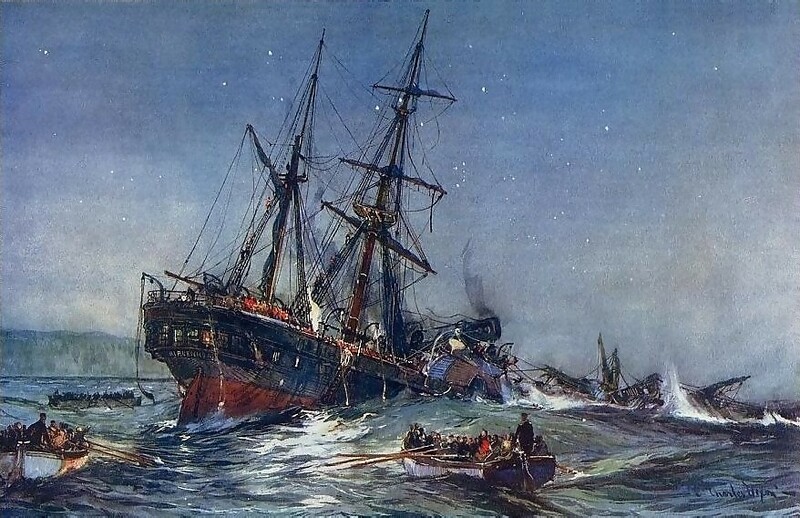 Later two of the boats were picked up by the schooner Lioness, and the survivors directed her to the wreck site where she rescued the forty men who had survived the night in the rigging. The ship’s gig had made for Cape Hangklip after leaving the wreck, and at about 4pm landed near Bot River. Local fishermen gave the survivors food and shelter, and provided Mr Culhane, Assistant Surgeon on the Birkenhead, with a horse on which he then rode to Cape Town, nearly 100 kilometres away, with news of the disaster. HMS Rhadamanthus was dispatched to search for survivors, and upon meeting the Lioness, took charge of the 116 people she had rescued, ferrying them back to Simon’s Town before returning again to search for other survivors. Ashore, the survivors of the swim, most nearly naked and certainly barefooted, trudged through the Strandveld on the eastern shore of Walker Bay. Some found initial shelter with fishermen at Stanford Cove, but with no food available they moved on until eventually all had been gathered together at Kleine Rivier near Stanford, the farm of an ex-Dragoon Guard, Captain Smales. There they were fed and clothed, while a search for further survivors continued up and down the coast for three more days. Although a few further survivors were found, including two men who had spent 38 hours in the water, those searching the rocks and beaches found mostly the dead – some tied to wreckage, many mutilated by sharks – they buried them in shallow graves wherever they were found. The loss of the Birkenhead was a maritime disaster of the first order in which about 445 of the 638 people aboard the vessel perished. However, it is not only for this reason that the Birkenhead is remembered and commemorated. The sacrifice by the troops who stood fast on the deck and allowed the women and children to be saved was an act of unparalleled selflessness which has echoed down the years, and the “Birkenhead Drill” as it is still known, of “women and children first”, remains one of proudest moments in British naval history. Kayle, A., 1990, Salvage of the Birkenhead. Southern Book Publishers, Johannesburg. Wexham, B., 1983, Shipwrecks of the Western Cape, Howard Timmins, C.T.